My art journal spread for Mother’s Day. 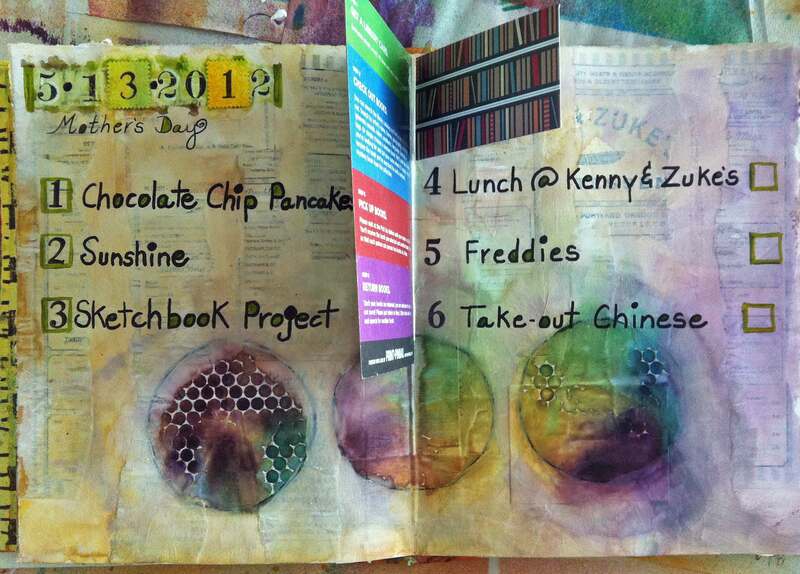 The first layer was created with a torn up menu from Kenny & Zukes Delicatessen applied with Golden soft body gel medium. I then covered that with a thin coat of gesso. Once it was dry, I used a handmade circle stencil with punchanella underneath and sprayed Adirondack color wash through the stencils. I used a wet paint brush to blend the colors to the rest of the pages. When that dried I used more gesso around the circles and let the colorwash blend to eliminate the hard lines of the circles. I added two tip-ins, both pieces of ephemera from the Sketchbook Project exhibit in Portland. I then added the date with stamps and hand wrote the highlights of my day. Enjoy! This entry was posted in 2012 and tagged art journal. Bookmark the permalink.